This post is part of the educational element of the 2015 URI Master Gardener Garden Tour, which my gardens are a part of. The tour is happening June 20 - 21 and you can find out all the information plus where to buy tickets, HERE. 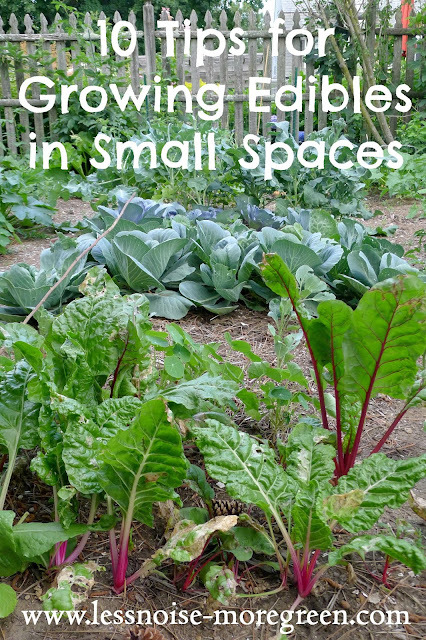 The one thing growing food in a small urban space forces you do is be creative! Over the years I've learned (often the hard way) some tricks to maximize my growing space. How many of these have you tried? Is your garden shady? Keep plants that thrive in full sun in pots. This has two advantages: a) The pot can be moved to follow the sun and b) The plants are taken out of crop rotation meaning you can grow them in the same spot year after year. Plant bush rather than vine varieties of squashes and cucurbits which will take up less bed space. There are now many varieties of plant grown specifically to thrive in containers which means they are compact growers. I grow slicing cucumbers up a trellis and bush pickling cucumbers in pots. Use trellises and pergolas to grow vining plants such as squashes and cucumbers up off the precious real estate of garden beds. Growing Pole Beans up a teepee takes up a fraction of the room needed to grow bush beans. I grow sauce tomatoes in pots against the house where they get radiant heat from the bricks and the driveway. Containers expand your growing space on to patios, porches, and driveways. Use the heat from your house and hardscapes to create green house-like heat for tomatoes and peppers. Just remember to water well. Add veggies and fruits to your flower containers. Try growing potatoes in bags or potato towers. Look for varieties that are big producers. With a small garden, plants must produce large harvests to merit the bed space they take up. In the middle of the summer zucchini tsunami. Harvest fruiting veggies like eggplants and zucchini often and when the fruits are small. This will encourage the plant to keep producing. This way, you get a large harvest from fewer plants. With a small space, you have to make choices. Grow your family's favorite fruits and veggies plus others on a rotating basis. Lettuces and radishes have short maturity times. Plant them between slow growers that will provide shade and space for the lettuce and radishes to mature well before the slow coaches need the room. Use perennial edibles such as blueberry bushes to create wind breaks or hedges. Plant rhubarb in your perennial flower beds and use low growing berries such as cranberries or strawberries as ground cover. This is a hard one. With a small garden the urge is to pack in the plants, but veggies need space and good air circulation to best fight off pests and disease. Cramped plants produce poorly. Fewer healthier plants will produce more yield than many stressed plants. Do you have any other tips to add to the list? Once you are producing a plethora of edible treats in your yard, what do you do now? Maybe it's time to step out and share the bounty beyond your family, friends and neighbors. Go ahead, take the plunge - grow to market!